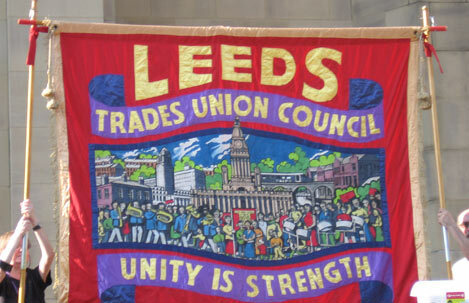 Leeds Trades Union Council bring together local affiliate trade union branches to campaign around issues affecting working people in their workplaces and local communities. Trades union councils generally aim to: Raise public awareness of rights at work and the union role in enforcing those rights; Promote organising and recruitment drives to build union membership; Support union and community campaigns for dignity and respect in the workplace and beyond. The PCS National Gallery Strikers will speak at the Leeds Trades Union Council Delegate Committee tomorrow. The brave workers have taken 17 days of strike action so far to fight privatisation of services at the Gallery and have started another 5 days of strike action from Tuesday 24 March 2015 until Saturday 28 March 2015. All affiliates are urged to attend the delegate meeting tomorrow at 7PM at The Swarthmore Education Centre, 2-7 Woodhouse Square, Leeds, Yorkshire, LS3 1AD and to support the protest at Leeds Art Gallery at 1PM on Thursday 26 March 2015 in solidarity with the National Gallery strikers.